(San Leandro, CA) – Every beer has a story to tell. The story behind 21st Amendment Brewery’s Tales From The Kettle series begins each year with the 21A Employee Homebrew Competition, where the staff breaks into randomly selected teams who are challenged to come up with a winning homebrew recipe judged by members of the San Francisco Brewer’s Guild. The teams include everyone in the company from pub servers, line cooks and bartenders, to the brewery’s packaging line, accountants, warehouse and marketing teams. It’s a tradition filled with friendly competition, and an ode to the brewery’s roots of fun and innovation. “Not Your Cup of Tea,” a Scottish-style ale brewed with black tea, is this year’s winning Tales from the Kettle beer and will be distributed nationwide as part of the 21st Amendment’s Insurrection Series of small-batch, limited release creations. The winning team received street cred and bragging rights, with their names proudly printed on the can. The tale behind “Not Your Cup of Tea” begins with a deep amber color of elegant toffee bubbles and dense foam. The aroma is remarkable with a light waft of sweetness and a soft smokiness. A rich complex flavor dominates through multi-layers of malt character, and it closes out with a light spiciness from the black tea and a lingering light burnt caramel finish. 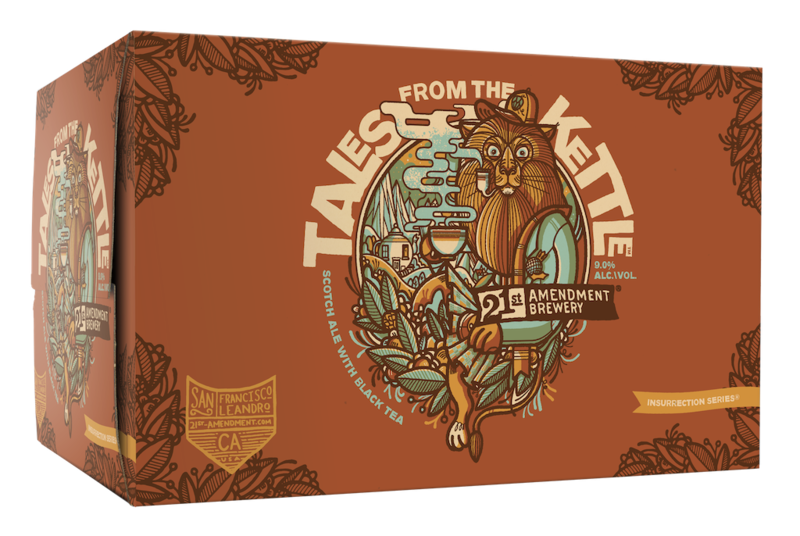 The 2017 Tales from the Kettle winner, “Not Your Cup of Tea,” is available at 21st Amendment’s San Leandro and San Francisco locations, and will be available nationwide in six packs and kegs in all 21A markets including AK, CA, DE, FL, GA, ID, IL, MA, MD, ME, MN, NC, NH, NJ, NV, NY, OH, OR, PA, RI, SC, VA, VT, WA and Washington D.C. It may inspire you to sing and dance with your dog or cat, write prose and solve the world’s problems, or simply lull you into a deep state of inner peace. Get yourself some Tales From The Kettle and create your own tale, and enjoy the beer with or without a kilt. In 2000, Nico Freccia and Shaun O’Sullivan opened the doors to the 21st Amendment brewpub in San Francisco’s historic South Park neighborhood with Freccia managing the restaurant and O’Sullivan spearheading the brewing process. In addition to quickly becoming one of the city’s favorite pubs, 21st Amendment began expanding beyond the Bay Area by helping to pioneer the movement to canned craft beer. In 2015, they opened a Brewery & Tap Room in San Leandro where most of their beers are made and canned. Known for artistic packaging, witty names and delicious brews, 21st Amendment offers year-round selections, seasonal offerings and its Insurrection Series of small-batch, limited releases. Sold in 25 states, 21st Amendment is among the top 50 craft beer breweries in America.